SysInfoTools for MS PowerPoint Pptm Recovery is an advanced repair tool to restore correctly your spoiled or corrupted Pptm files, you can select Pptm files and recover the data from corrupted Pptm files. SysInfoTools for MS PowerPoint Pptm Recovery software repair corrupt Pptm files and successfully recovers data such as graphs, tables, Unicode character, cell data, formulae, Images, text formatting, notes and all standard cell's properties from corrupted MS PowerPoint Pptm file. SysInfoTools MS PowerPoint Pptm Recovery software open Pptm files and repair the selected data from corrupted Pptm files which are corrupt due to various reasons such as virus, system shut down while saving the file etc. and recreates an Pptm files and then save recovered data to new working Pptm file. SysInfoTools for MS PowerPoint Pptm repair demo version recovers corrupt Pptm file and show the maximum repaired content of the Pptm file. Saving function is disable in demo version. To save the repaired content of corrupt Pptm file purchase the full version of SysInfoTools for MS PowerPoint Pptm repair. Please try our Demo version of software before purchasing the full version so that you can satisfy after seeing your maximum repaired data from your corrupt Pptm file. Your satisfaction is our success. For any kind of queries we have dedicated support team that is available for you 24 X 7. 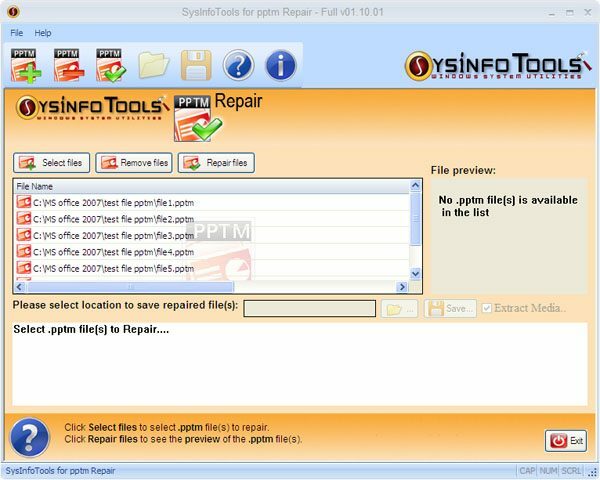 SysInfoTools PowerPoint PPTX Repair is a best available tool to repair your corrupt PPTX file. It has Two repair modes to repair your PPTX file and slides and images preview feature lets to judge its performance and usability. FILERECOVERYÃ‚Â® 2011 Professional Mac runs natively under the Mac OSX file systems 10.4 and higher, and recovers lost data and volumes from HFS/HFS+, HFS+, HFSX , HFS Wrapper, all FAT and NTFS file systems. Repairing of corrupt MS Word files is now become very easy task to perform. With the help of MS Word Docm Repair tool users can easily fix/remove corruption from their corrupt MS Word documents. It quickly recovers all data from corrupt Docm files. FILERECOVERYÃ‚Â® 2011 Enterprise Mac runs natively under the Mac OSX file systems 10.4 and higher, and recovers lost data and volumes from HFS, HFS+, HFSX , HFS Wrapper, all FAT and NTFS file systems. Systools Outlook Contacts to Lotus Notes software transfer outlook to notes contacts without any alteration or updating. Software saves your data in (names.nsf) format. Software supports orphan PST and configure PST file at time of conversion. This site does not contain serial number, crack, keygen SysInfoTools Pptm Repair serial number : serial number is the simplest type of crack. A serial number(cdkey,product key,etc) is register the program as you may already know. a crack or keygen may contain harmful software. If you cannot find the exact version you want, just give it a try. for more information read .nfo/.txt/.diz file include in zipped file.